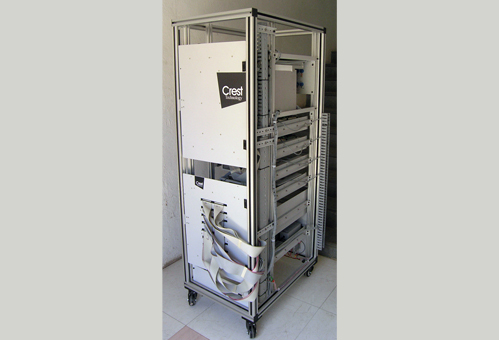 Real Time Simulator – Crest Test Systems Pvt. Ltd. The Real Time Simulator, RTS 1.4 is a specialty test system that makes use of dSPACE signal-generation hardware to generate several analog and digital events, and helps to simulate real world events in real time. The RTS interface makes use of swappable pre-wired modules to allow quick changeover between different DUTs. The DUT receives the signals from RTS 1.4 in an amplified and conditioned form, and perceives them as actual situations and responds accordingly. The integrity of stimulus and response helps to establish that the DUT is performing as expected. The analog and digital inputs and outputs available on dSPACE hardware are conditioned to suit the input-output levels of the DUT. Built-in auxiliary power supplies are used to power analog amplification channels. Highly accurate, low drift analog amplifiers are used for signal amplification. Well-engineered interfacing hardware ensures mechanical and electrical robustness, as well as, accuracy, stability and repeatability of electrical parameters.